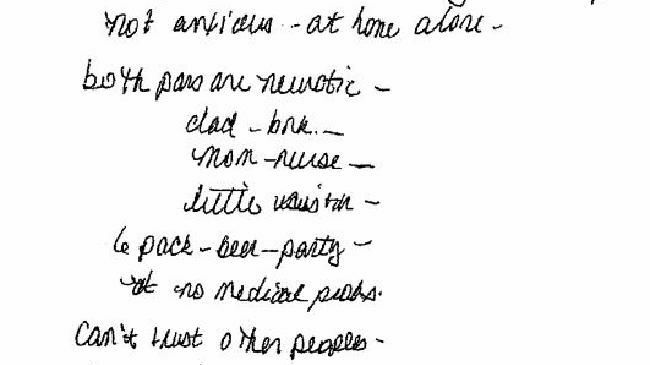 Psychiatric notes released to public about Aurora Theater killer James Holmes, handwritten by social worker Margaret Roath. THE psychiatrist's handwritten notes said he was hostile towards her, but he'd made no threats. And had no history of violence. He had expressed homicidal thoughts, but whenever she tried to address specifics, he told her if he revealed more details she would "lock him up". He was silent and sullen, but when she asked how he was going, he said "good". That was in May, 2012. Two months later, James Holmes pulled out four guns in a Colorado movie theatre and opened fire, killing 12 people, and injured 70 more. Six years after Holmes - who became known as the Batman Killer - unleashed death and terror at a late-night premiere screening of The Dark Knight Rises, his psychiatric records have been unsealed by the judge who presided over his 2015 murder trial. They are a series of psychiatric evaluations released to the public earlier this month after a campaign and legal petition by The Denver Post. 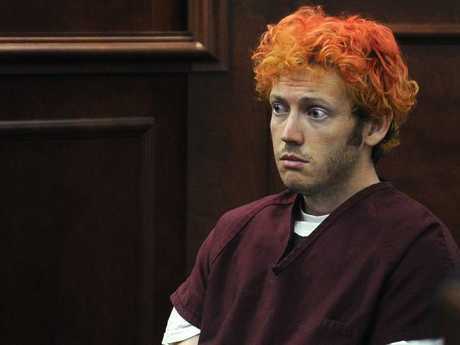 They include sanity evaluations by two psychiatrists who examined Holmes after the shootings, in the months leading up to his death penalty trial. Holmes has pleaded not guilty by reason of insanity, but both concluded while he was mentally ill at the time of the massacre, he was legally sane because he knew his actions were wrong. And then there are the notes made by Dr Lynne Fenton, a University of Colorado psychiatrist who briefly treated Holmes ahead of the massacre, when he was a graduate. Her notes were given to the jury at the trial, and discussed in court, before Holmes was found guilty and given the death penalty. There was interest in her notes in the wake of the Aurora Theater massacre, because she had chosen not to place a mental hold on Holmes, something some speculated might have prevented the shootings. She was sued over that decision, but the lawsuit was dismissed in 2016. 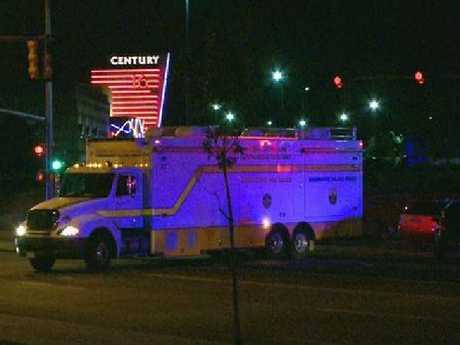 The Century 16 cinema in Aurora, Colorado, after the mass shooting on July 20, 2012. Psychiatric notes released to public. 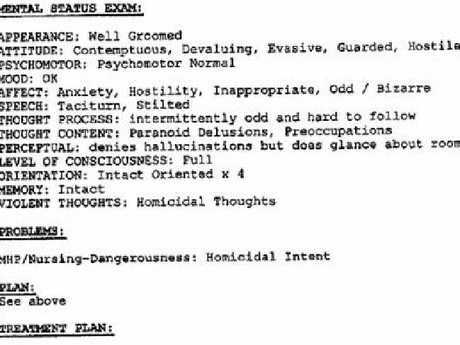 This one, a mental status exam, by Dr Fenton. "HE SAYS HE WANTS TO KILL OTHER PEOPLE"
Holmes had been referred to Dr Fenton by University of Colorado social worker Margaret Roath in March 2012, who noted it was "hard to interview him as he would just start and take a long time to answer". "When I asked him about other symptoms, he said he did not want to say as I would have to report him. He says he wants to kill other people, but no one in particular and has never done anything to harm others," Roath noted. A note of Obsessive-Compulsive Disorder was accompanied by the description that "(Holmes) has problems concentrating, eats OK, does not have crying spells and does not have thoughts of suicide." The document said that Holmes has trichotillomania, (a hair-pulling disorder), called his parents "neurotic" and has to walk after eating. In an email to Dr Fenton to see him "soon if possible", Ms Roath described Holmes was the "most anxious guy I have seen". "Most concerning is that he has thoughts of killing others people, though I do not think he is dangerous," she said, adding Dr Fenton would see him as it "might be best to keep him in the system". Dr Fenton did see Holmes several times in the lead-up to the massacre, and the notes reveal by June she was concerned enough to consult a second psychiatrist, notify the university's threat assessment team, and contacted his mother against his wishes. But he did not meet the criteria for a mental health hold. 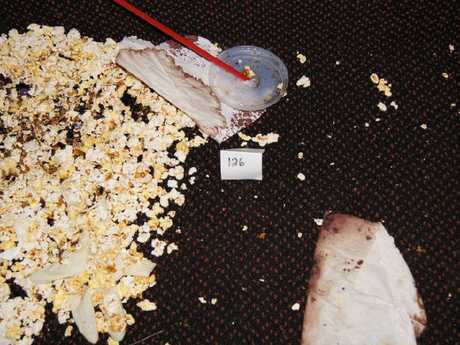 Chilling images made available by Aurora prosecutors show inside the midnight screening of Batman film "The Dark Knight Rises,". Holmes had “thoughts of killing people”. "HE DENIES ANY SPECIFIC TARGETS"
In her notes, Dr Fenton expressed concern over Holmes's homicidal thoughts but his lack of a willingness to address specifics with her. He told her if she revealed more details she would "lock him up." 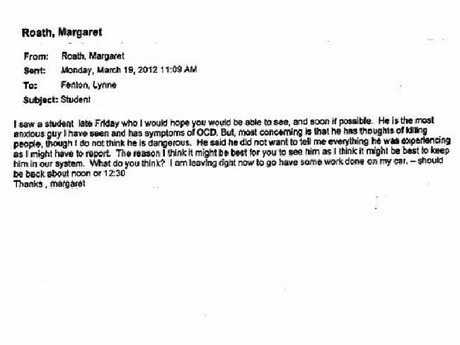 Those in charge of his courses has told her of his "extremely awkward" social interactions and "odd comments", but "neither had heard of him making threatening remarks", she noted in a June client summary. A background check had revealed no weapons permits, she said. "At this point. 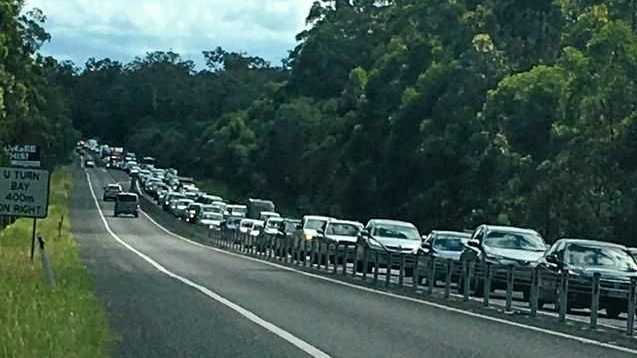 James is … intermittently functioning at a psychotic level," Dr Fenton wrote. But she concluded he "does not currently meet criteria for a mental health hold". "He is not gravely disabled and has no evidence of suicidal ideation. Longstanding homicidal ideation but denies any specific targets and there is no current evidence he is angry at the grad school (or anyone else)." She noted that while Holmes had made hostile remarks to her and another psychiatrist, he had not made threats. James E. Holmes appears in Arapahoe County District Court in Centennial, Colorado. Little did she know that as Holmes was attending sessions with her, he was also buying up an arsenal of weapons, perfecting his aim on a gun rang two hours drive away and making detailed plans in a notebook that would become key evidence in of his murder trial. "The Notebook", he said, would be the work which explained "why I did what I did', and at one point he wrote in it that it could be used in future by psychiatrists to help treat people like him. The notebook was initially addressed to his mother, dad and sister, but he sent it to Dr Fenton before the killings - knowing it would not reach her until his murderous spree was over. On July 20, 2012, Holmes took his four guns and went to Theatre 9 for the sold-out premiere of The Dark Knight Rises. He slipped out of the cinema, propping the emergency exit open. About half an hour into the film, he returned through the emergency exit, wearing a ballistics helmet, bulletproof vest, bulletproof leggings, a gas mask and gloves. He detonated several smoke bombs, stood in front of the screen, and began firing. At one point, he reportedly went outside, shooting terrified patrons as they tried to flee. Police caught him in his car behind the cinema. He was in full riot gear and carrying three weapons, including an AR-15 assault rifle, a Remington 12-gauge shotgun, and a .40 caliber Glock handgun. A fourth handgun was in the car. Holmes, hair dyed bright orange, told arresting officers that he was "The Joker," referring to the villain in the second instalment of the "Batman" movie trilogy, "The Dark Knight." Holmes, found guilty of 12 murders, is serving 12 consecutive life sentences in jail, plus 3318 years without parole. He avoided the death penalty because the jury could not come to a unanimous decision.